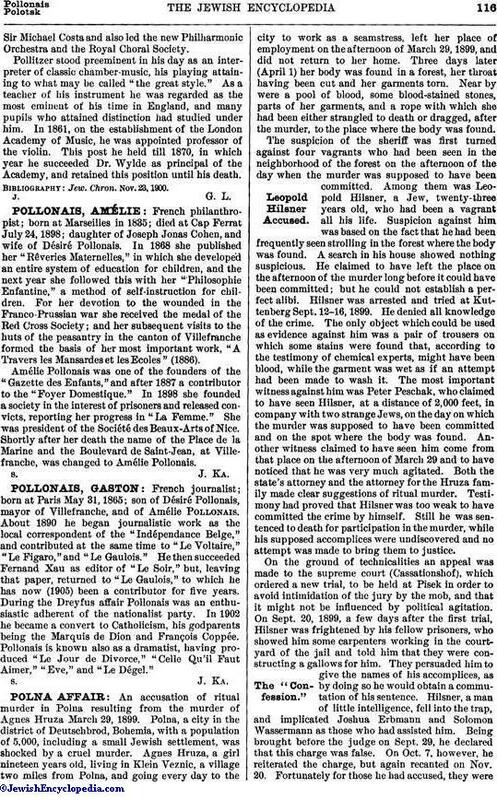 An accusation of ritual murder in Polna resulting from the murder of Agnes Hruza March 29, 1899. 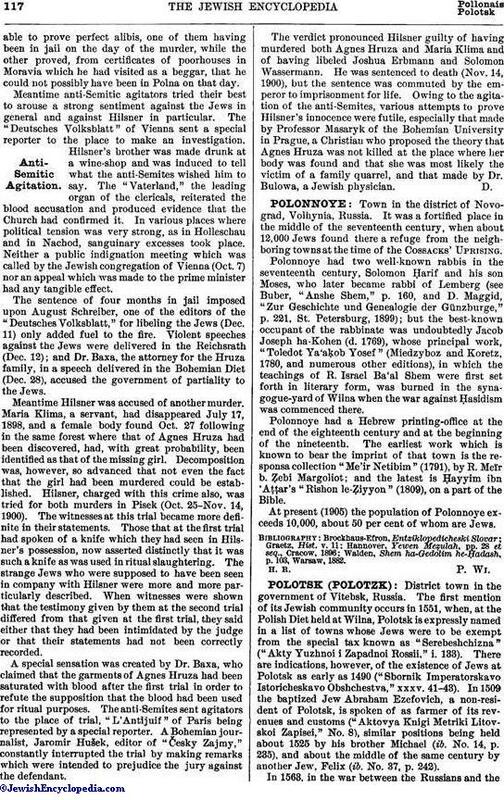 Polna, a city in the district of Deutschbrod, Bohemia, with a population of 5,000, including a small Jewish settlement, was shocked by a cruel murder. Agnes Hruza, a girl nineteen years old, living in Klein Veznic, a village two miles from Polna, and going every day to the city to work as a seamstress, left her place of employment on the afternoon of March 29, 1899, and did not return to her home. Three days later (April 1) her body was found in a forest, her throat having been cut and her garments torn. Near by were a pool of blood, some blood-stained stones, parts of her garments, and a rope with which she had been either strangled to death or dragged, after the murder, to the place where the body was found. The suspicion of the sheriff was first turned against four vagrants who had been seen in the neighborhood of the forest on the afternoon of the day when the murder was supposed to have been committed. Among them was Leopold Hilsner, a Jew, twenty-three years old, who had been a vagrant all his life. Suspicion against him was based on the fact that he had been frequently seen strolling in the forest where the body was found. A search in his house showed nothing suspicious. He claimed to have left the place on the afternoon of the murder long before it could have been committed; but he could not establish a perfect alibi. Hilsner was arrested and tried at Kuttenberg Sept. 12-16, 1899. He denied all knowledge of the crime. The only object which could be used as evidence against him was a pair of trousers on which some stains were found that, according to the testimony of chemical experts, might have been blood, while the garment was wet as if an attempt had been made to wash it. The most important witness against him was Peter Peschak, who claimed to have seen Hilsner, at a distance of 2,000 feet, in company with two strange Jews, on the day on which the murder was supposed to have been committed and on the spot where the body was found. Another witness claimed to have seen him come from that place on the afternoon of March 29 and to have noticed that he was very much agitated. Both the state's attorney and the attorney for the Hruza family made clear suggestions of ritual murder. Testimony had proved that Hilsner was too weak to have committed the crime by himself. Still he was sentenced to death for participation in the murder, while his supposed accomplices were undiscovered and no attempt was made to bring them to justice. On the ground of technicalities an appeal was made to the supreme court (Cassationshof), which ordered a new trial, to be held at Pisek in order to avoid intimidation of the jury by the mob, and that it might not be influenced by political agitation. On Sept. 20, 1899, a few days after the first trial, Hilsner was frightened by his fellow prisoners, who showed him some carpenters working in the courtyard of the jail and told him that they were constructing a gallows for him. They persuaded him to give the names of his accomplices, as by doing so he would obtain a commutation of his sentence. Hilsner, a man of little intelligence, fell into the trap, and implicated Joshua Erbmann and Solomon Wassermann as those who had assisted him. Being brought before the judge on Sept. 29, he declared that this charge was false. On Oct. 7, however, he reiterated the charge, but again recanted on Nov. 20. Fortunately for those he had accused, they wereable to prove perfect alibis, one of them having been in jail on the day of the murder, while the other proved, from certificates of poorhouses in Moravia which he had visited as a beggar, that he could not possibly have been in Polna on that day. Meantime anti-Semitic agitators tried their best to arouse a strong sentiment against the Jews in general and against Hilsner in particular. The "Deutsches Volksblatt" of Vienna sent a special reporter to the place to make an investigation. Hilsner's brother was made drunk at a wine-shop and was induced to tell what the anti-Semites wished him to say. The "Vaterland," the leading organ of the clericals, reiterated the blood accusation and produced evidence that the Church had confirmed it. In various places where political tension was very strong, as in Holleschau and in Nachod, sanguinary excesses took place. Neither a public indignation meeting which was called by the Jewish congregation of Vienna (Oct. 7) nor an appeal which was made to the prime minister had any tangible effect. The sentence of four months in jail imposed upon August Schreiber, one of the editors of the "Deutsches Volksblatt," for libeling the Jews (Dec. 11) only added fuel to the fire. Violent speeches against the Jews were delivered in the Reichsrath (Dec. 12); and Dr. Baxa, the attorney for the Hruza family, in a speech delivered in the Bohemian Diet (Dec. 28), accused the government of partiality to the Jews. Meantime Hilsner was accused of another murder. Maria Klima, a servant, had disappeared July 17, 1898, and a female body found Oct. 27 following in the same forest where that of Agnes Hruza had been discovered, had, with great probability, been identified as that of the missing girl. Decomposition was, however, so advanced that not even the fact that the girl had been murdered could be established. Hilsner, charged with this crime also, was tried for both murders in Pisek (Oct. 25-Nov. 14, 1900). The witnesses at this trial became more definite in their statements. Those that at the first trial had spoken of a knife which they had seen in Hilsner's possession, now asserted distinctly that it was such a knife as was used in ritual slaughtering. The strange Jews who were supposed to have been seen in company with Hilsner were more and more particularly described. When witnesses were shown that the testimony given by them at the second trial differed from that given at the first trial, they said either that they had been intimidated by the judge or that their statements had not been correctly recorded. A special sensation was created by Dr. Baxa, who claimed that the garments of Agnes Hruza had been saturated with blood after the first trial in order to refute the supposition that the blood had been used for ritual purposes. The anti-Semites sent agitators to the place of trial, "L'Antijuif" of Paris being represented by a special reporter. A Bohemian journalist, Jaromir Hušek, editor of "Česky Zajmy," constantly interrupted the trial by making remarks which were intended to prejudice the jury against the defendant. The verdict pronounced Hilsner guilty of having murdered both Agnes Hruza and Maria Klima and of having libeled Joshua Erbmann and Solomon Wassermann. He was sentenced to death (Nov. 14, 1900), but the sentence was commuted by the emperor to imprisonment for life. Owing to the agitation of the anti-Semites, various attempts to prove Hilsner's innocence were futile, especially that made by Professor Masaryk of the Bohemian University in Prague, a Christian who proposed the theory that Agnes Hruza was not killed at the place where her body was found and that she was most likely the victim of a family quarrel, and that made by Dr. Bulowa, a Jewish physician.